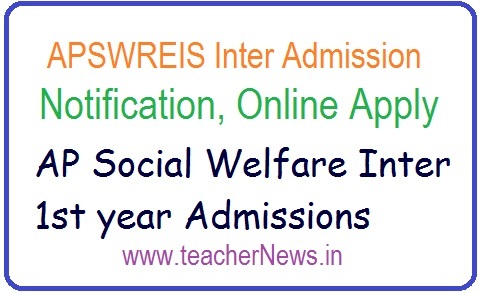 APSWREIS Inter Admission Notification 2019 | APSWR Junior Colleges Online Apply last date : APSWREIS Intermediate Admission Notification at http://apgpcet.apcfss.in/Inter/. APSWREIS Jr College Admissions Notification Available now. APSWREIS Inter 1st year admissions 2019 notification, Apply Online till March 26. APSWREIS Junior Inter Admissions, APSWR Junior Colleges Admissions, APSWRJCs Junior Inter Admissions, Last date to apply for AP Social Welfare Inter 1st year admissions, Download Junior Inter admissions application form, Eligibility criteria, Selection list and Results Announcement date, Counselling date and other details given here. APSWR Junior Colleges Intermediate Admissions into 1st Year admissions Notification released. Andhra Pradesh Social Welfare Residential Educational Society Intermediate Admissions Notification released. This Admission Notification is for admission into 1st year intermediate of 163 APSWR Junior Colleges for the Academic Year 2019-20. Detailed Notification, Counseling Dates, List of APSWR Junior Colleges is available below. Admission into APSWREIS Junior Colleges Online Application form at http://apgpcet.apcfss.in/Inter/ Website. (a) The students who are appearing for SSC exam in March/April , 2019 are eligible for submitting their applications online. However, their final seat allotment will be subject to their clearing the examination in the first attempt. (b) If the group desired by the student is not available in the same district, the student can apply in another district of the same Zone. (c) The students should apply within his/her own district. (d) Students who studied Telugu Medium in 10th Class are also eligible to apply in English Medium Colleges. (e) Boys have to apply in Boys Colleges and Girls have to apply in Girls Colleges only. The age of the student shall not exceed 17 years as on 31.08.2019. In case of the students who studied in APSWR Schools and S.W. Hostels a relaxation of 1 year will be given. Finally, fill yours details and Submit it. Admission test will be held in the subjects’ viz., Telugu, English, Mathematics and Science and Social based on the State Syllabus of class X of A.P. State Government. The questions will be in objective type (Multiple Choice Questions) and will be in English/Telugu Medium. Test will be conducted in the selected centers of the district. The students may choose any one of the centers as per their convenience in the State. గమనిక: తల్లిదండ్రుల ఫోన్ నెంబర్ మాత్రమే ఇవ్వవలెను మునుముందు ఈ ఫోన్ నెంబర్ కి మాత్రమే, అడ్మిషన్ కి సంబంధించిన వివరాలు వస్తాయి. 1. Selections will be made on merit basis subject to fulfillment of ‘Eligibility’ and ’Reservation’. 2. Only those candidates will be admitted in Magnet schools and COEs who have passed SSC Public Examination 2019, in first attempt and should have secured 60% marks in aggregate and should have secured 55% marks in English in SSC Public Examination 2019. 3. Students will be allotted in the following order. The first merit to APSWR COE Visakhapatnam and COE, Pulivendula as per allocation of the districts in the merit list. 2. Last date for submission of filled in applications through ONLINE is : 26.03.2019. 3. The test will be held on 04-04-2019 from 11.00 A.M. to 01.30 P.M.
APSWREIS Inter Admission Notification 2019 |APSWR Junior Colleges Online Apply @ apgpcet.apcfss.in/Inter. APSWREIS Intermediate Admission application form link here.